The post Sirius and Mercury: The Unlikely Friendship Between a Dog and a Miniature Horse by Audrey Pavia appeared first on Dogster. Copying over entire articles infringes on copyright laws. You may not be aware of it, but all of these articles were assigned, contracted and paid for, so they aren’t considered public domain. However, we appreciate that you like the article and would love it if you continued sharing just the first paragraph of an article, then linking out to the rest of the piece on Dogster.com. As far back as ancient Rome, dogs were used to guard farm animals from wolves and other predators. Centuries later, the descendants of those dogs are still hard at work. Called the Maremma Sheepdog, this Italian livestock guardian breed is particularly good at taking care of sheep and goats. Here in the U.S., Maremmas care for another small animal that needs protection: the Miniature Horse. 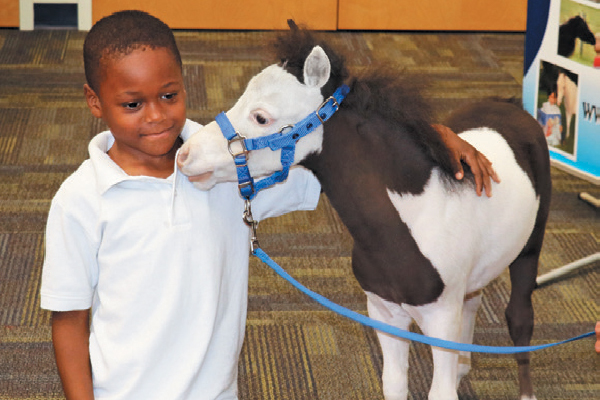 Miniature Horses make wonderful therapy animals. Photography courtesy Gentle Carousel Miniature Therapy Horses. Gentle Carousel Miniature Therapy Horses is a Miniature Horse farm and training facility where tiny horses, protected by Maremmas, are taught to become therapy horses. Teams of specially trained Minis travel around the country, visiting more than 25,000 adults and children each year at hospitals and hospice centers. They also provide comfort to families, veterans and first responders who have experienced traumatic events. These diminutive equines have been called in to help survivors and first responders immediately after the mass shootings at Sandy Hook Elementary School in Newtown, Connecticut; the Emanuel African Methodist Episcopal Church in Charleston, South Carolina; and the Pulse nightclub in Orlando, Florida. They have also comforted victims of tornadoes, child trafficking, fires and hurricanes. When these special horses are home on their 15-acre farm in Gainesville, Florida, they are watched over by two adult and three young Maremmas, all of whom protect the small horses from coyotes and loose dogs. One of those young Maremmas, a puppy named Sirius, has become quite close to a colt named Mercury. The pair is learning how to walk up and down steps together, ride in a truck around the farm, and to walk and stand on a lead. When Mercury travels for a hospital training visit with his mother, Sirius waits on the farmhouse porch for him to return. The best part of their friendship is that they will be able to maintain it for the rest of their lives. Thumbnail: Photography courtesy Gentle Carousel Miniature Therapy Horses. Will Brain Games Improve Cognitive Functions in Dogs?